Does Spanish Moss Kill Trees? Does Spanish Moss Harm Trees? In some parts of the United States, Spanish broom is considered an invasive weed because of its tolerance for poor soils and drought conditions. It is similar to Scotch broom but is of a different genus; its scientific name is Spartium junceum. It is most often used as an ornamental plant or as ground cover in poor, rocky soils. Turn over the area of soil you want to plant. Spanish broom tolerates most any kind of soil, but it must be loose enough for germination. Loosen at least the top few inches of soil with a rake or cultivator. Broadcast the seeds. They need not be in rows, groups or any other method other than simply spread or tossed over the ground that has been broken. If you are planting only a few seeds, be sure you don’t press them down any further than 3 inches or so. Rake again to cover them lightly with soil. It’s not necessary to painstakingly cover every seed if there are many, but they should have a very light layer of soil over them for best germination. Water the seeded area. Water sparingly so that the shallow-placed seeds don’t wash out of the area you desire them to sprout in, but give them enough to moisten the soil. The seeds can be expected to sprout within the month, if warm temperatures are present. No watering besides natural rainfall is needed. If they are planted during late fall or winter, they will not germinate until the spring. Position the Styrofoam correctly in or on the container you are using for your project. If you are using hot glue, plug in your hot glue gun. Apply the hot glue or the craft glue to the entire surface area of the Styrofoam you wish to cover with Spanish moss. Place the Spanish moss over the Styrofoam, attaching it to the glue you applied in step 3. Gently press the Spanish moss onto the Styrofoam so that it stays attached to the Styrofoam. Allow the craft glue to dry or the hot glue to cool before proceeding with your arrangement. Spanish moss does not kill trees, but it can block sunlight from getting to the inner branches and prevent photosynthesis. Spanish moss may weigh down and break branches. If Spanish moss is affecting the health of a tree, remove the moss to allow sunlight into the interior of the tree. Spanish moss (Tillandsia usneoides) is an epiphytic plant, growing on other plants for support. It does not need soil. Instead, it takes moisture and nutrients from the air to make its food. Spanish moss (Tillandsia usneoides) is not a parasite, but it can damage the tree by shading the leaves and preventing photosynthesis. Branches with a heavy load of Spanish moss might break under the weight. Removing the moss solves the problem and allows sunlight to penetrate the tree again. Learn the correct pronunciation. Happy Valentine's Day in Spanish is Feliz Día de San Valentín, which is pronounced: (fay-LEESS) (DEE-ah) (deh) (SAN) (val-en-TEEN). Ask a native speaker to pronounce the phrase so you hear the correct pronunciation and stressed syllables. Remember the accents. When writing Feliz Día de San Valentín, don't forget the accents to show where the stress is in pronunciation. Stress is important in Spanish because a word's meaning can change if used incorrectly. Use correct punctuation. When writing Happy Valentine's Day in English, an exclamation point often appears at the end of the statement to indicate excitement. In Spanish, when using an exclamation point at the end of a statement the writer must also use an upside down exclamation point at the beginning of the phrase. For example, ¡Feliz Día de San Valentín! Think about common alternatives. Consider two common expressions, with nearly the same meaning: Feliz Día de los Enamorados and Feliz Día del Amor y la Amistad. Happy Lovers Day is a literal translation for Feliz Día de los Enamorados. Happy Love and Friendship is a literal translation for Feliz Día del Amor y la Amistad. Remove some moss from a tree branch with pruning shears and cut it up into small pieces. Sprinkle the moss over the area that needs fertilizing. Till the Spanish moss into the soil to a depth of 6 inches. Although the moss can be found from southern Virginia and along the Gulf Coast, in the United States, Spanish moss is commonly found in South Louisiana and Florida. In Florida and South Louisiana the moss grows in commercial quantities. Spanish moss grows best where rainfall is heavy. The moss itself absorbs water quickly and is 25 percent water. The moss also grows well in places where there are high temperatures and high humidity. This is the reason that the swamp lands of Florida and Louisiana are prime places for the moss' growth. Spanish moss is similar to flowers and spreads by propagation. Fragments of the moss are carried from tree to tree by the winds or birds. 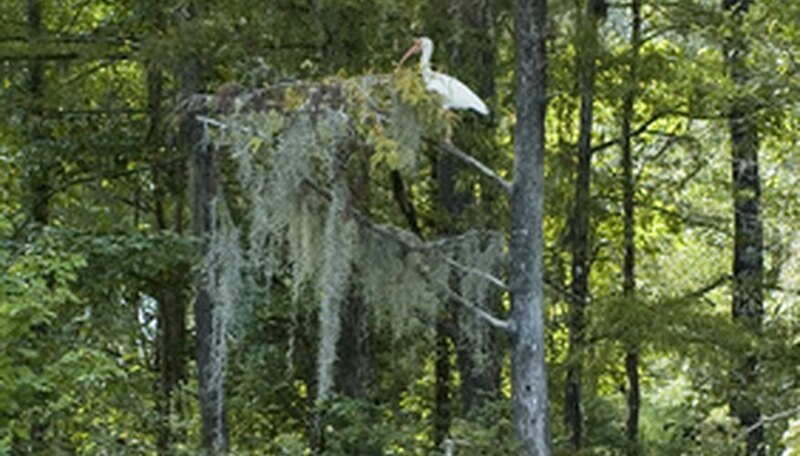 Birds, which use pieces of the moss when building their nest, play a huge role in the growth of Spanish moss. The moss is also perfect for the creation of floral arrangements. Because the moss holds moisture well, it is used around the plant base of floral arrangements to lengthen the longevity of the flowers. One way that Spanish moss has been used is for upholstering. The moss is made of a fibre material, and this fibre serves well in furniture stuffing, such as mattresses, cushions and automobile seats. Today, the moss' use in mattresses is confined to Southern Louisiana, and is normally only used in rural areas. The resiliency of moss makes it desirable for upholstery use. Insects will not attack, destroy, live in or eat moss fibre. This makes the moss very resilient. Spanish moss has also been used for construction purposes. In the past, the moss was used for binding mud or clay while plastering houses. Mud and clay chimneys are commonly covered with Spanish moss. Make or purchase decorative pillowcase shell. Stuff Spanish moss into the case until the desired fluffiness is achieved. Sew the seam closed and use the new pillow as you would any decorative pillow in your home. Fill cut flower vases half full with water. Fill the remainder of the vase with Spanish moss. This will help keep the cut flowers in the desired pattern in the vase and keep water evaporation from the vase to a minimum. Use 1 to 2 inches of Spanish moss as a mulch around potted plants. Spanish moss will help retain moisture in the soil and reduce watering needs. Add 3 to 4 inches of Spanish moss as a mulch around outdoor plants to retain moisture. This is especially helpful during dry periods during the hot, summer months. What Side of the Tree Does Moss Grow On?